TIME TO REMOVE MULCH FROM YOUR PEONIES! Swenson Gardens > Uncategorized > TIME TO REMOVE MULCH FROM YOUR PEONIES! Seems like forever this spring that I’ve been waiting to post about removing mulch from your peonies! For those of you in USDA growing zones 2-4, remove and discard your mulch on the peonies. With the very late spring, we are suggesting to remove it ALL now vs half now and the other half in 7-10 days. This late into the spring does not have the extreme temperature swings like we normally do earlier in the spring. 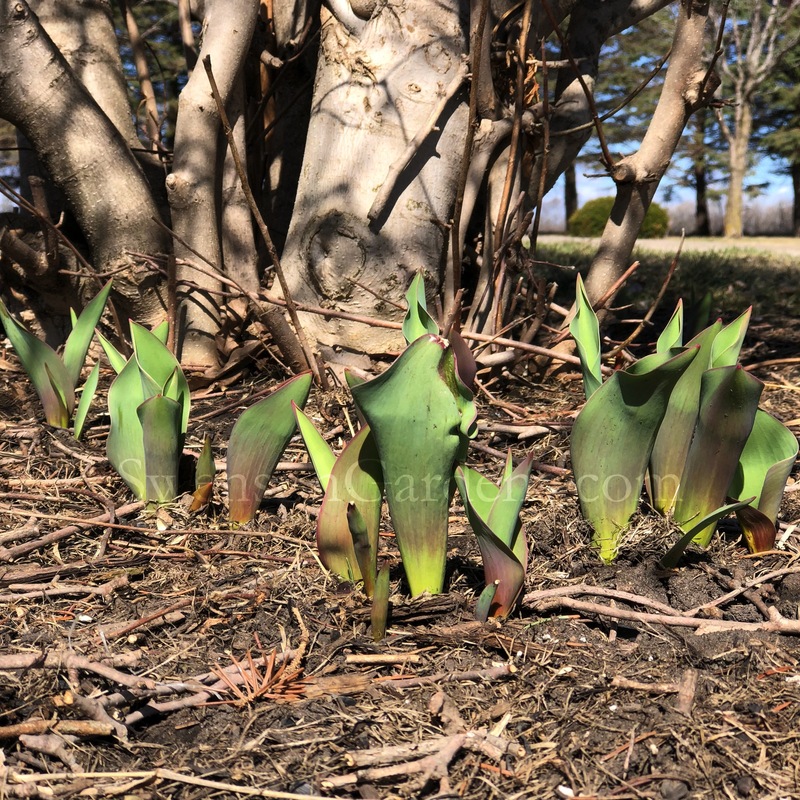 Knowing that the tulips here are about 8″ tall, is the other sign to look for. 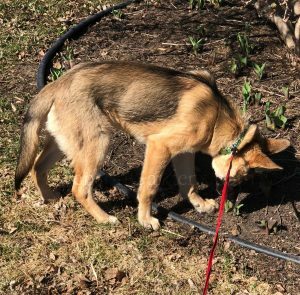 If only we could train Heidi to remove the mulch from our peonies vs trying to eat the new toys coming up out of the ground! I had to put another pic of Heidi in this peony post. 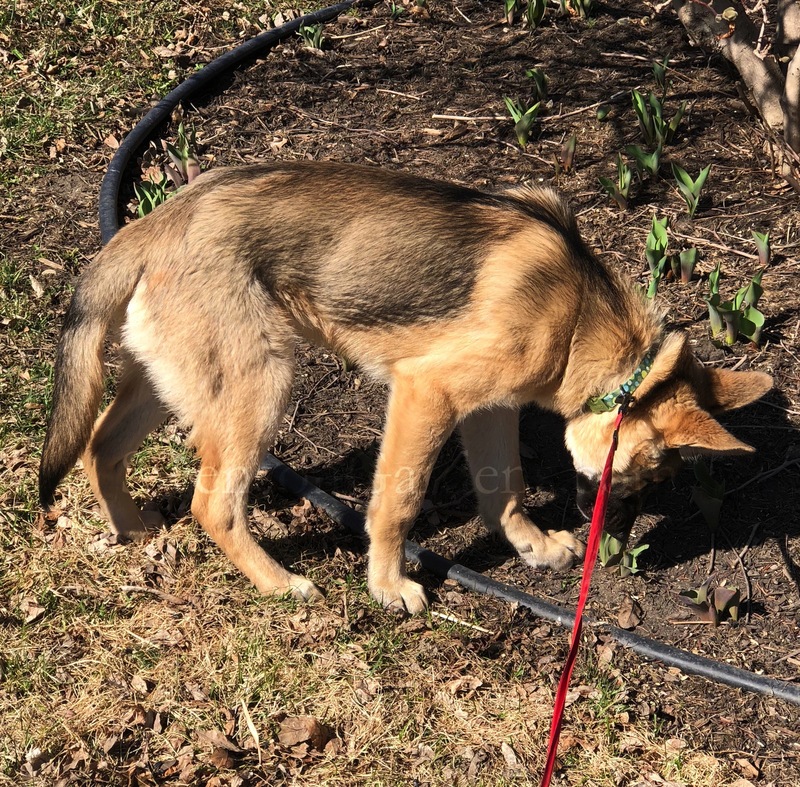 She is definitely a handful when it comes to distractions like tulips coming up! It won’t be long now until we see the first peony soldiers FINALLY having some above ground growth. Not sure what Heidi will do then? I did notice some of the eyes have turned a deeper red which means blooms in about 6-weeks. Yes this is a rule of thumb based on temperatures to come and hoping that this year we do not receive a late frost that nipped some of the early blooming varieties last year. Thank you to those of you in warmer growing zones that sent us pictures of your SwensonGardens.com blooming peonies. We LOVE to see your pics! Remember when removing mulch from your peonies that you need to keep it about 1 foot away from the crown so your soil can start to warm up!